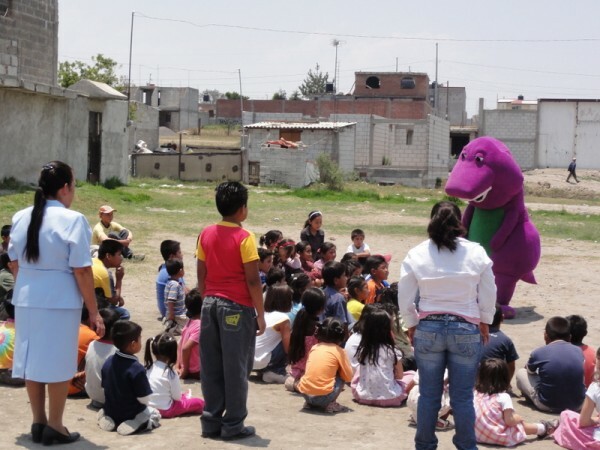 We have been here in Mexico for 16 years now. 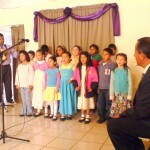 We have started three mission churches here in our city. (Our goal is to start twenty.) We have two other national pastors that have started two other works outside our state. 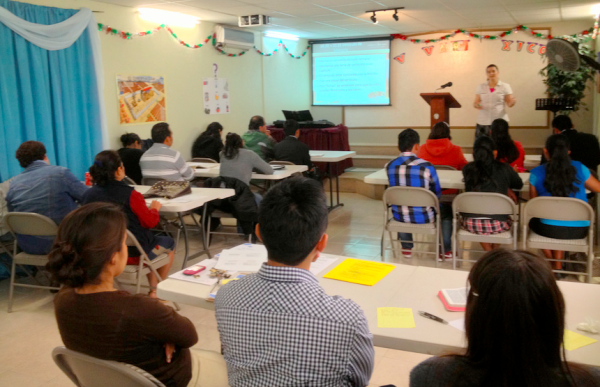 We have a Bible Institute with 19 students right now. Our church is growing. And just last week we sent out our first missionary from our own church to India! And I can’t wait to see how God is going to use them in reaching the souls in that, very needed country, with the Gospel. Please pray for Bro. Jav-ier and his family. 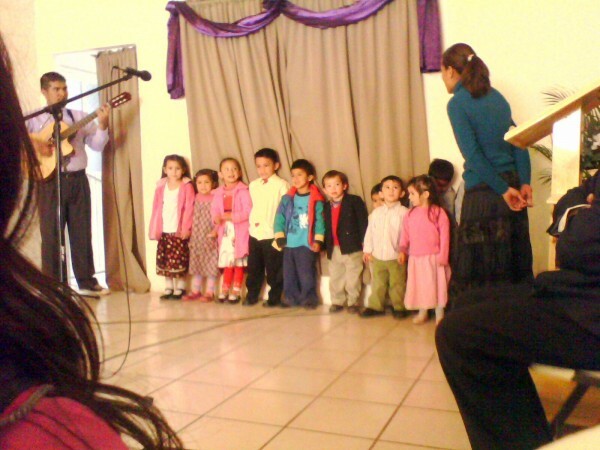 During the time they were in our church, they constantly brought people to our church. He and his wife went soulwinning almost every day. 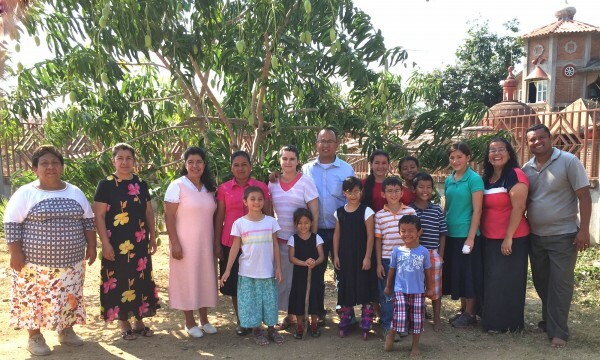 Wherever they went, they always shared the Gospel with many, many people. And I know God is going to use them in a very special way in India. We have been in our new place for eight months now, but we are still adjusting to it. We praise the Lord that He gave us this building in a miraculous way! We are working hard to make this building meet the needs of our church as much as possible. 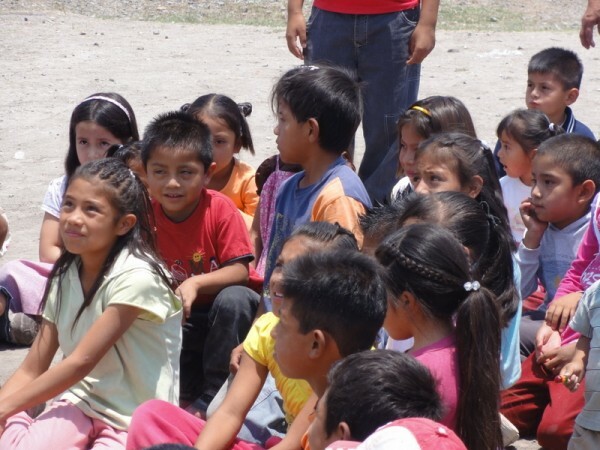 We need more classrooms and we also need to build some walls to close the warehouse-style building that we have. 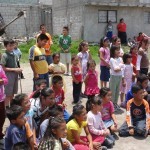 Please pray that God will provide all the funds that we need for that. I love when I see the excitement of our people, specially while the church develops into a better place of worship. And I also love the fact that we are all growing in His Grace! 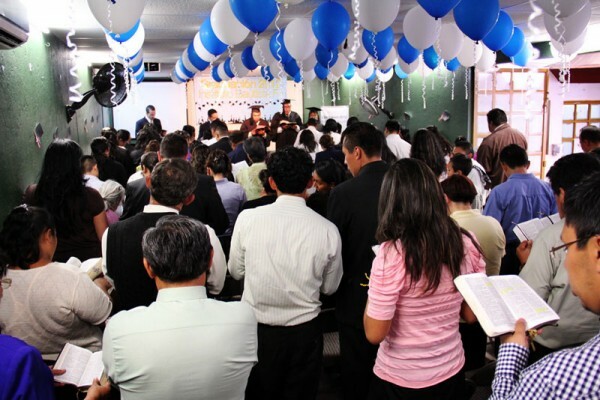 Just before we moved, we had about 140 people in our church. Now we are running close to 170 people every Sunday! Our goals is to have 200 people in our church by the end of the year. Please pray for our National Leadership Conference coming up in lees than two months. We want to have our church ready for the conference as much as we can. Specially pray that the conference will be a help and a blessing for those attending it! We are expecting close to 50 Pastors come to our conference. Our goal is to motivate every Pastor that comes to the conference to do more for God. Last year we spent close to nine thousand dollars for the conference. I don’t know how the money will come this year, but God always provides! 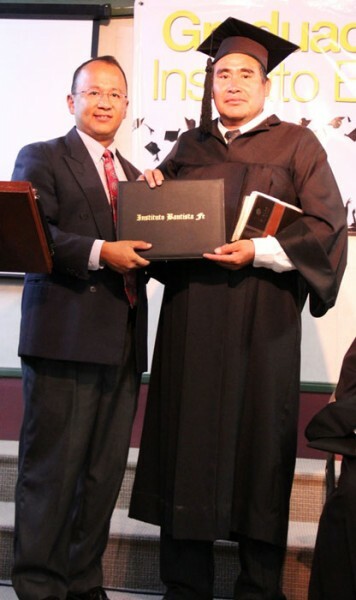 At the end of last year, we had a young man named Fernando come to our church. He lives down the street from our church. 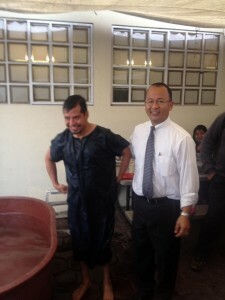 During the invitation, Fernando lifted up his hand, and a man in our church led him to the Lord. Fernando had many problems. The most important problem that he had — besides him not being saved — was that he was a drug addict. 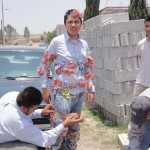 Few weeks after he got saved, he was found dead, not very far from his own house. His family were destroyed when they heard the news. 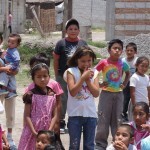 We reached out to them and few days later, his mom and dad came to church. Praise the Lord they got saved that night! Fernando’s mom said to me that she wants to continue what Fernando wanted. And that is — to bring more young people to the feet our our Savior. Pray for them, as this coming Wednesday night they are starting a discipleship program here in our church. You never know when someone else’s life will come to an end. All we need to do is reach them before it is too late. 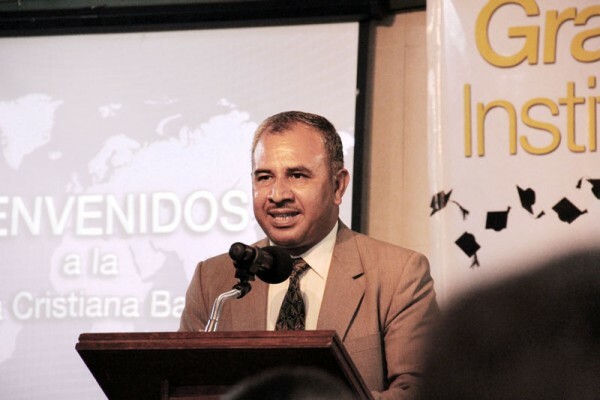 And, praise the Lord — Fernando is in a better place! Thank you for praying for us and thank you for your support! 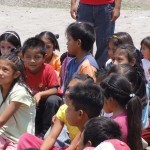 We are looking for someone to come to Mexico and help us as a “teacher” for our kids. We home school our seven kids, and the young girl that was helping us is about to get married. If you know someone that will be willing to come and help for six months or a year, that will be a blessing for us. 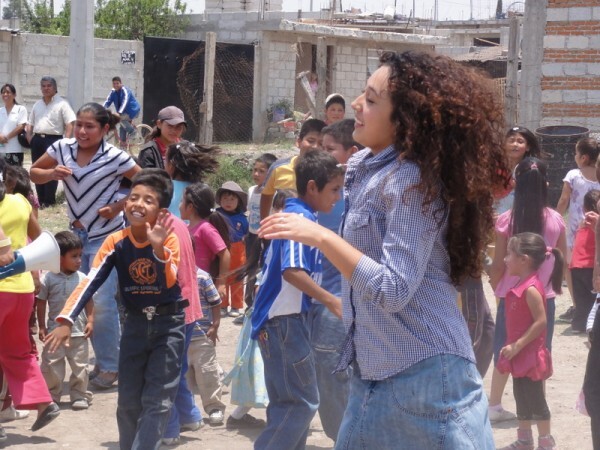 It will be good for someone that would like to learn Spanish, help in the mission field, and help us with the kids. It’s actually not that hard, since we have the A Beka curriculum, with videos and books. All she needs to do is more to supervise than to teach. If you are interested, give us a call. 760-494-7883. Last week, on July the 8th, we celebrated our 10th year anniversary. What a privilege to serve the Lord for all these years. 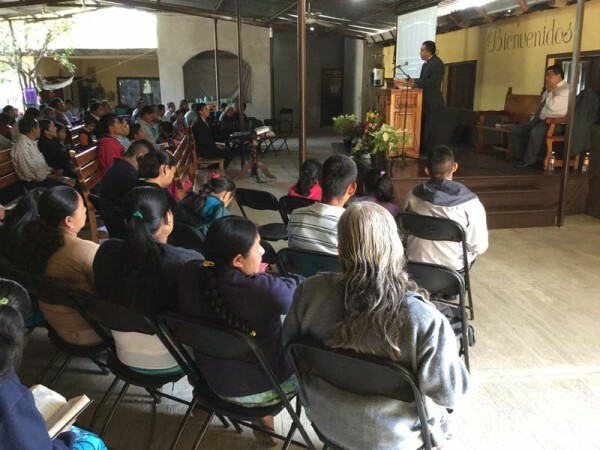 Our guest preacher was Pastor Adolfo Lima from Iglesia Bautista Libertad in Tehotihuacan, Mexico (Next to where the Sun and Moon pyramids are located). We had 200 people in attendance, with many visitors. 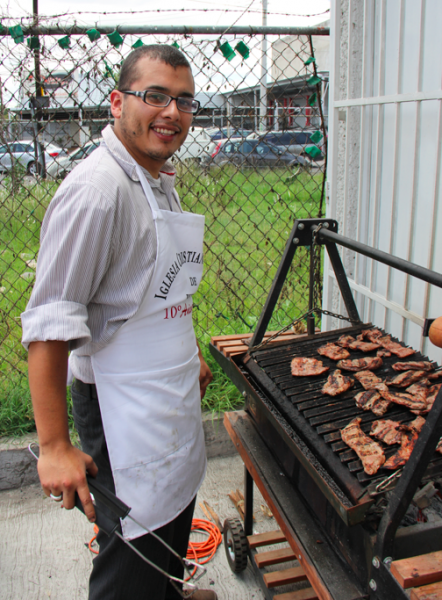 After the Service we had our famous Carne Asada de Arrachera (a special cut steak that we have here in Mexico.) It was very good and juicy! My brother Elimelec and some other people from our church helped grill this steaks. Sunday night we had 150 in attendance and two people surrendered for Full-time-service — a son and a dad! Praise the Lord! That Sunday started a very busy week. 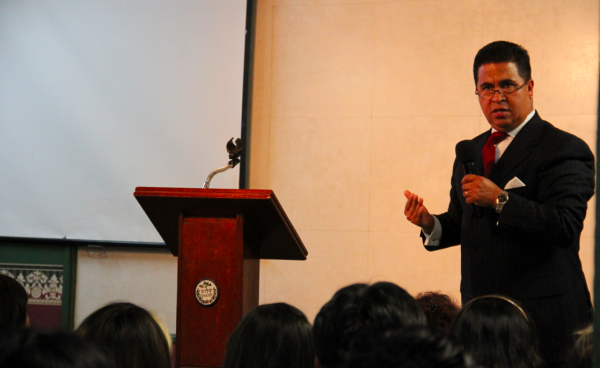 On Monday I took our youth to a Youth Conference in Mexico City (Bro. 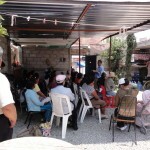 Kevin Wynne’s church), which is about 1 hour and a half from Puebla. 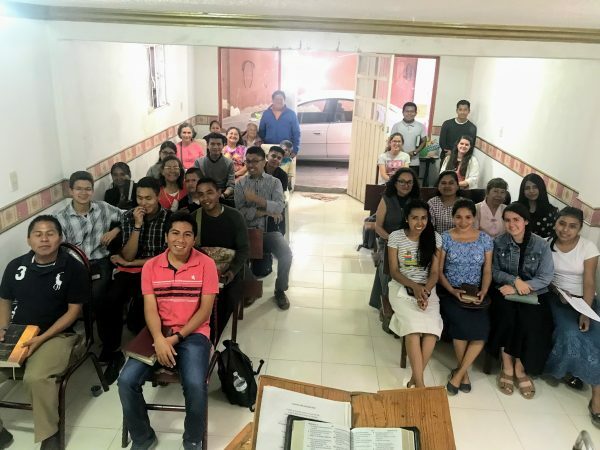 Then on Monday night we went to Cuautla, and took another group there to listen to Pastor Ezequiel Salazar and Pastor Gil Torres for a preaching conference at Pastors Peter Duke’s church. Both preachings were great! 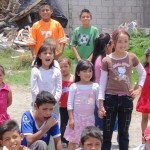 That same Monday we had another group that took of to a Family Camp in the Riviera Maya (about 24 hours near Cancun). Then on Tuesday, after a great victory (our anniversary) the devil wasn’t happy and our church was robbed at 5:50 am. 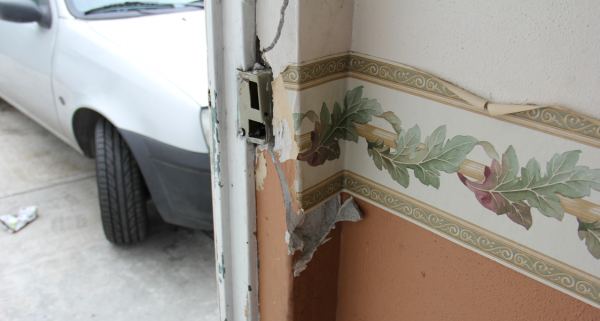 Three young men came in a taxi, forced the front door open, and took: two laptops, a computer, our Sunday’s money, two drills, and old vacuum, a portable speaker, and a bike. Close to $2,000 dollars total. We gave thanks to the Lord, and kept on going. 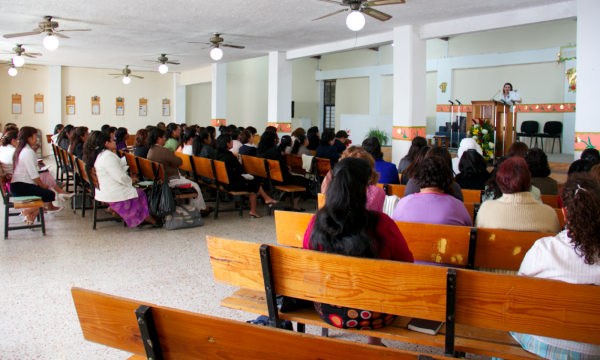 Actually, I don’t know of a church in Mexico that has not been broken into. If yours is one of them, make sure to have strong locks and hard doors. We have the video of the thieves. Hopefully the police will catch them — which I highly doubt — and have our things returned. If you would like to donate to buy any of the items that we lost, we would appreciate that very much. Already a lady of our church said that she had $500 dollars for a laptop. Praise the Lord! Thank you for all of your prayers and support. Today was a very exciting day. 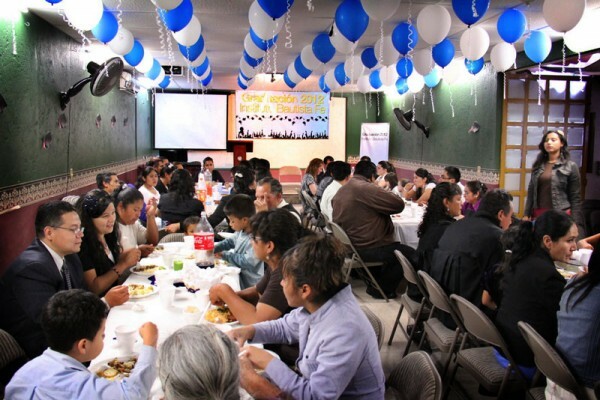 We had 200 people in church! 140 in our own church and 60 in our mission church which is 3 miles away. Bro. 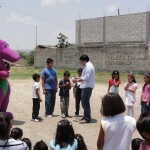 Erik is in charge of our mission work and he is doing a good job there! We also had a missionary visiting our church this morning. 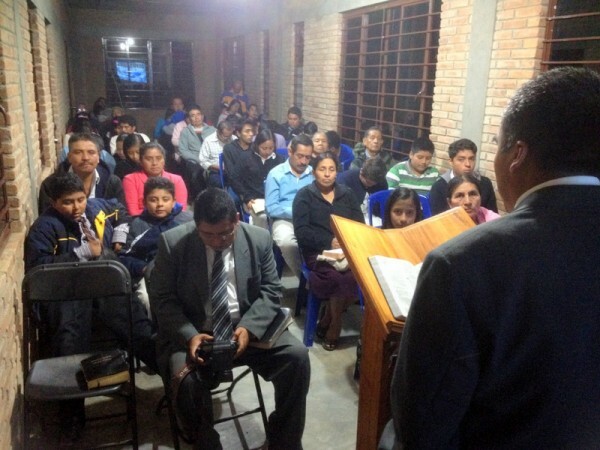 Brother Guillermo Acuña, missionary to Tequisquiapan, Mexico, preached in our church. 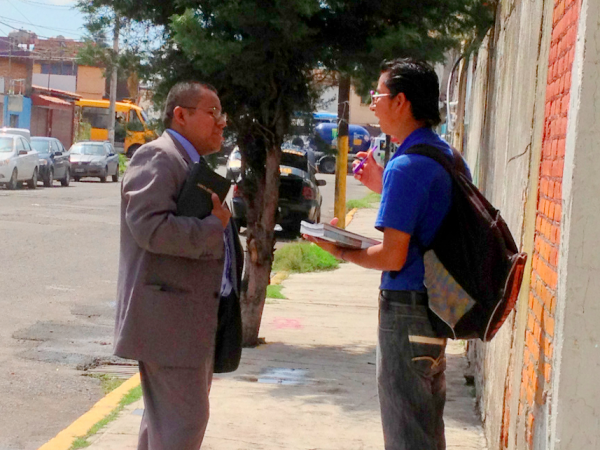 He did a good job preaching and we certainly would like to take him on as one of our missionaries. 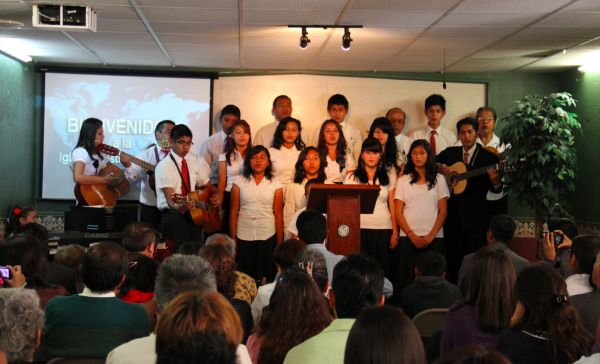 Currently we have 18 missionaries that we support on a monthly basis. We also praise God for the 15 visitors that we had this morning and 2 more visitors on our evening service. 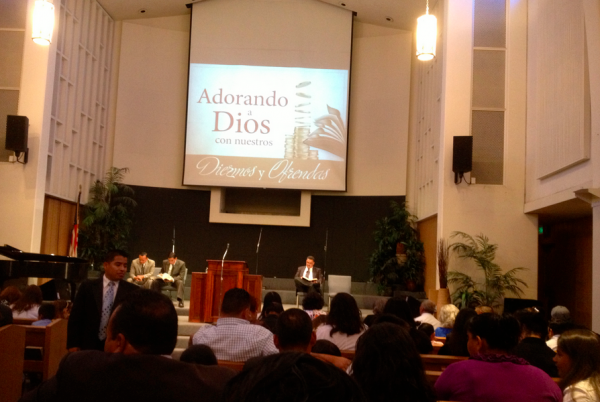 We had 9 adults getting saved and it was certainly another blessed day and victory for our church. 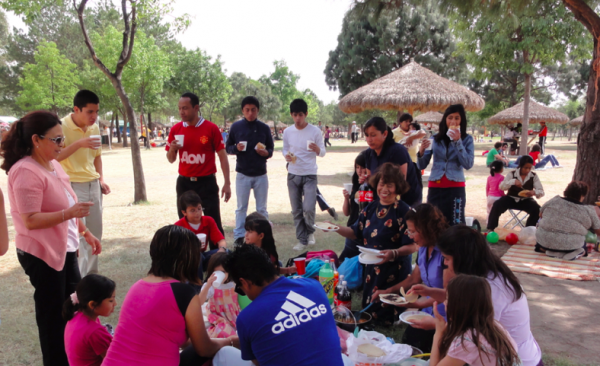 After the church service in the morning we headed to the park for our first picnic of this year. The park’s name is “Parque Ecológico de Puebla”. 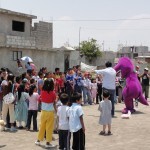 When we first arrived in Puebla 10 years ago, this park was not very clean and had few services. Now is totally a different park. 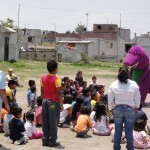 It has a man-made-lake, play grounds for the kids, areas to play basket-ball, football soccer. And different areas to have bar-b-q. 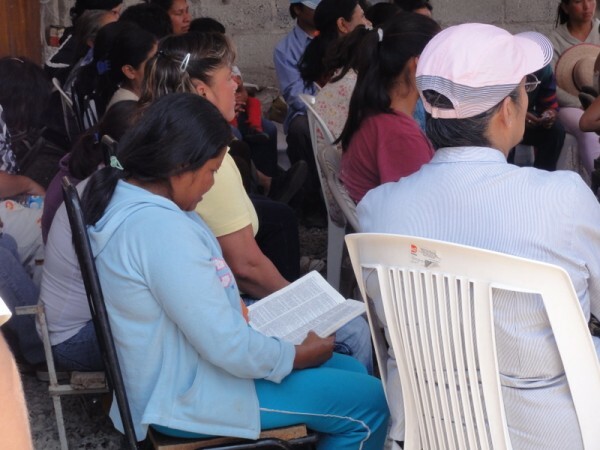 Our Bible Instituto keeps going strong. 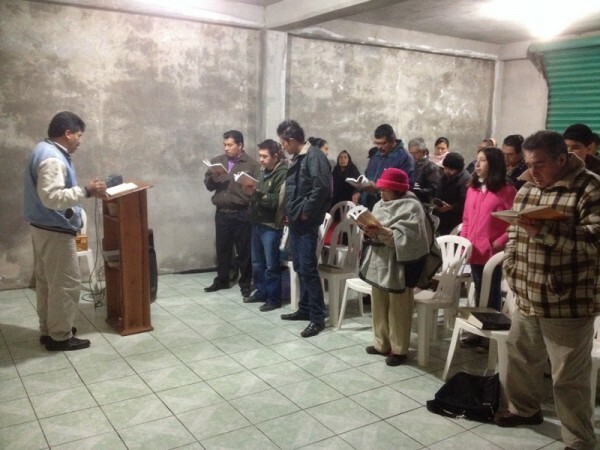 We have 9 in the Instituto and one of the highlights is that every Friday night we have a different Pastor that teaches on “How To Start a Church.” So far we’ve had 7 pastors and we are expecting to have 8 more to come and teach. If you know someone that is a pastor or a missionary in Mexico or South America, let me know so that we can send them the material and videos that we are recording. 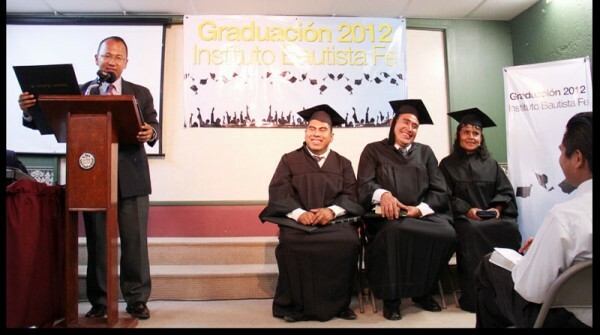 We are also going to publish all the material and videos on our website: Instituto Bautista FE. 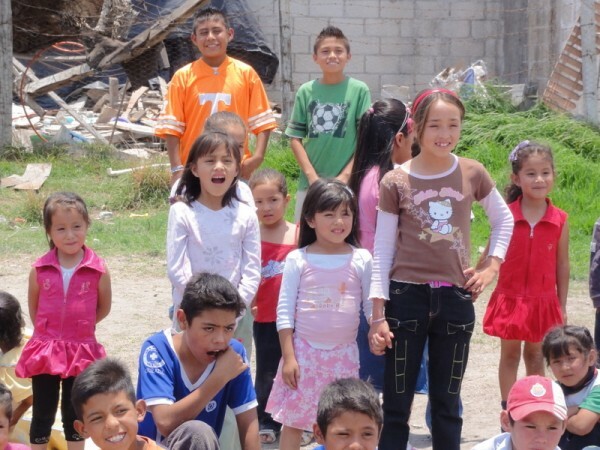 If you would like to take a missions trip to Mexico, consider Puebla, as is one of the safest cities in the country of Mexico! 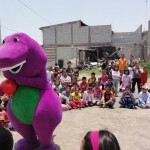 185 Present, 32 Adults and Many Kids Saved! First, I would like to thank those that were praying for our Special Day this last Saturday. As you might now, at the beginning of the year, Mrs Medel — one of our Sunday School teacher of our church — was about to quit teaching a small group of kids (about 4 or 5) but decided to be faithful and keep teaching them every Saturday evening. 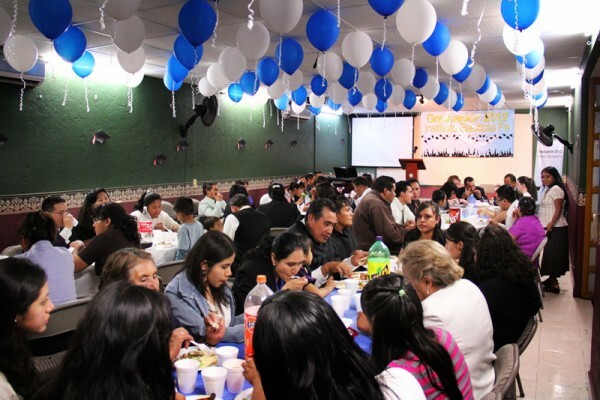 Yesterday we were able to see again the fruits of her labor and faithfulness, as we had 185 attending our Special Day and brought many moms and dads and kids to our meeting. 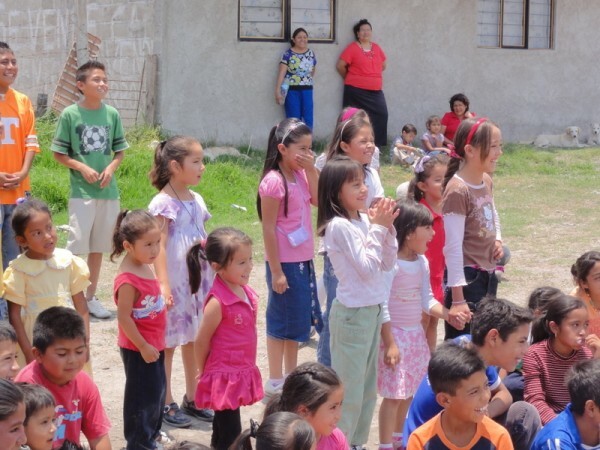 We had 53 adults and 132 kids. 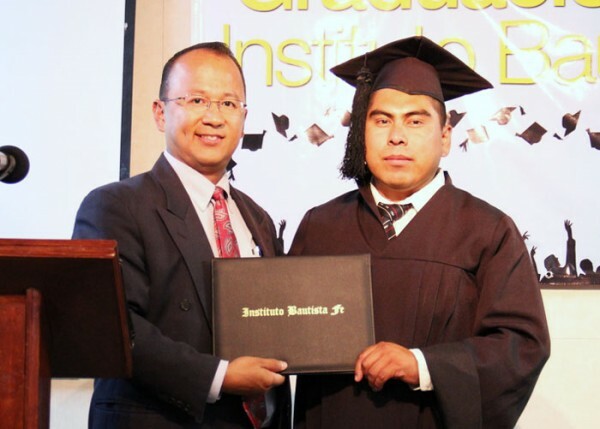 Erick, a young man in our church that just graduated from a Bible Institute, asked me about having this Special Day. 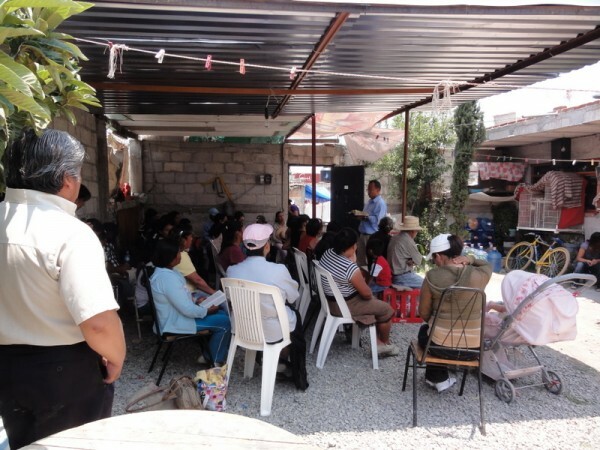 He is already going every Wednesday to this community and teaching the Bible Basics to these dear people. 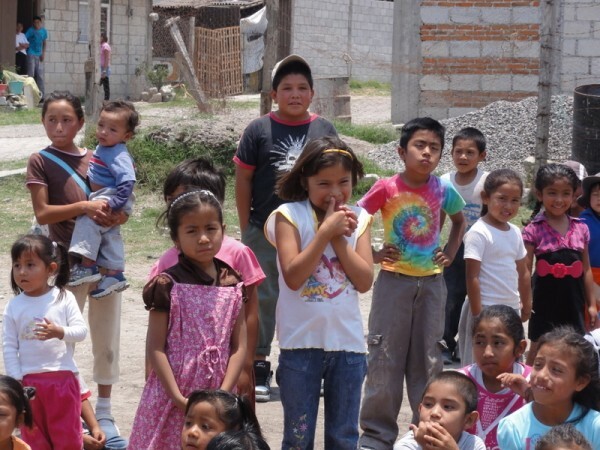 This community is right at the south-end of Puebla. Anyway, Erick is going a good job about going and teaching and bringing people to church. 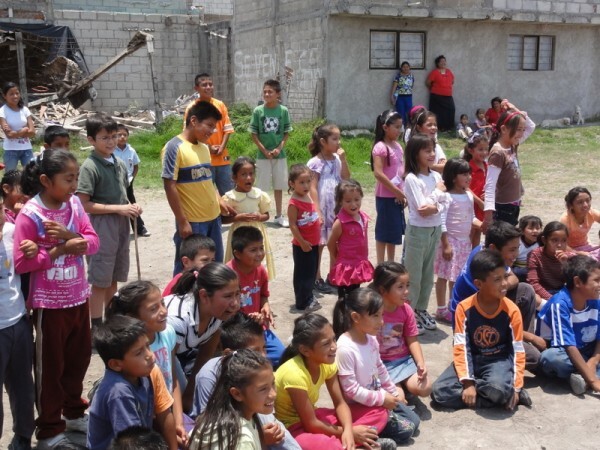 So, it was his idea, and he was very excited about me preaching to the adults and him preaching to the kids (almost like a vacation Bible School) and having games and prizes for them as well. 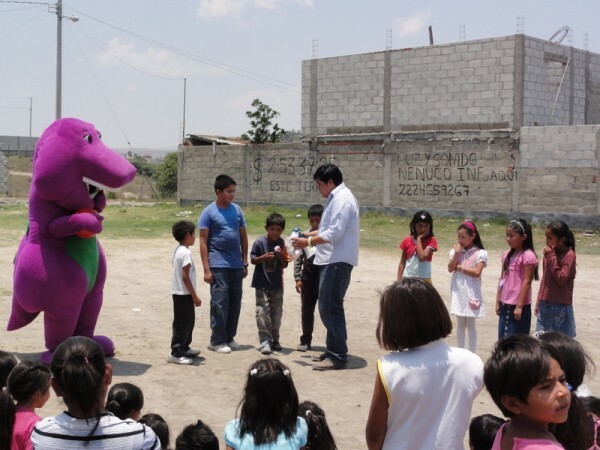 We rented a “Barney custom.” Jorge, one of our young man in our church, wore the thing for over two hours and had a lot of fun going it. 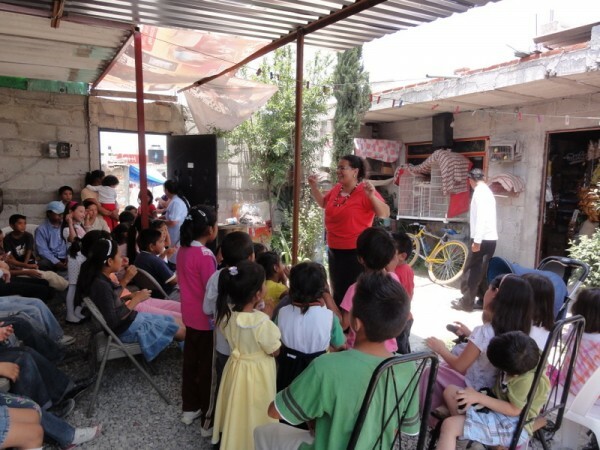 We announced to the community that we were having a Special Day with Bible Stories and games. 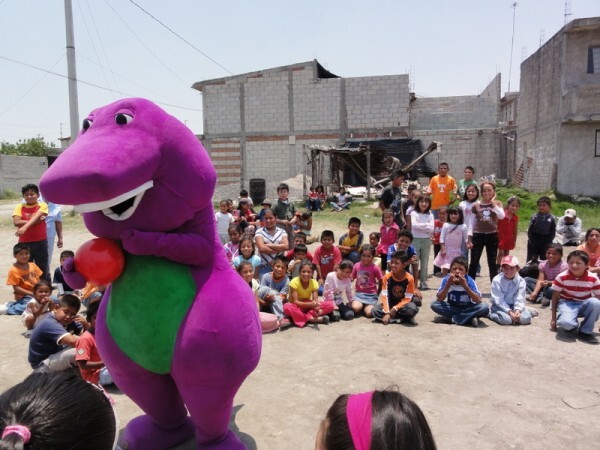 We drove up and down the dirt streets and had lots of kids saying hi to Barney… I wish we had a Jonah-and-the-whale-custom, but this was the less dangerous one. 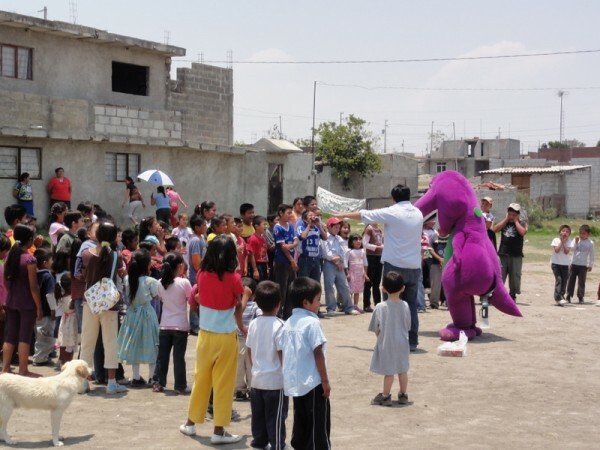 Anyway, it was fun and Erick was able to preach and teach salvation to lots of kids and I had the opportunity to teach about how to be saved to the adults. 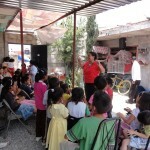 I had 32 Adults that asked Jesus to saved them! 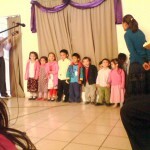 and Erick said that many, many kids also got saved! Please pray for all of them that got saved that might continue with the Bible teachings that we have on Wednesday and that many of them will grow in the Lord. 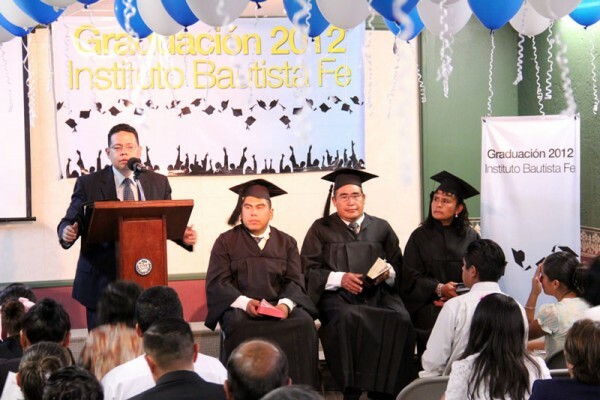 This last Friday we had our last day in our Bible Institute. We had over 20 registering at the beginning of the year and most of them made it to the end. I thought Bible Homiletics and my wife Nicole thought Virtuous Women to the ladies on Fridays. This year we did not have anyone graduate as this is only our third year, and our program to graduate is four years. 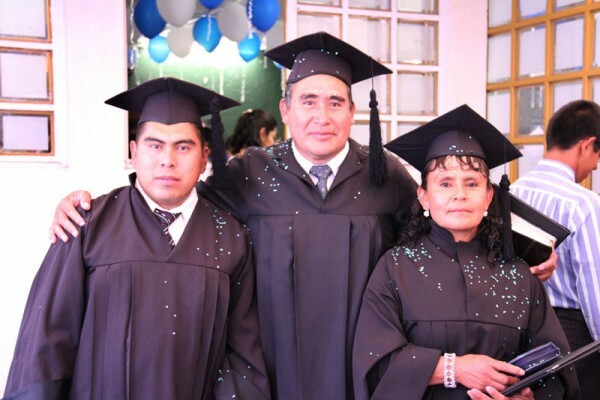 Next school year for our Bible Institute we would like to have six different classes with six different teachers. 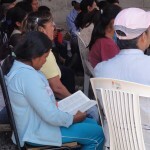 Lord willing in one year, we would like to have a regular-morning Bible Institute. Right now our classes are Tuesdays, Thursdays and Fridays at 7 PM. Today was a very special day because today we finished reading the Bible as a family during our family devotions! We read all of the Bible with our kids and we were all very excited about it. Tomorrow we are starting again. What a blessing is to have family devotions every night and see how God uses that to nurture our family and help us grow spiritually. We even took a video about our last chapter reading and singing with our kids. I encourage you to have family devotions with your family as well. You can start tomorrow and maybe we can even finish up at the same time in about 1,189 days! (as this is the number of chapters that the Bible has). Today we had a full house, with three first time visitors and one lady saved. Please pray for my son David as he apparently has allergies to we-don’t-know-yet what. 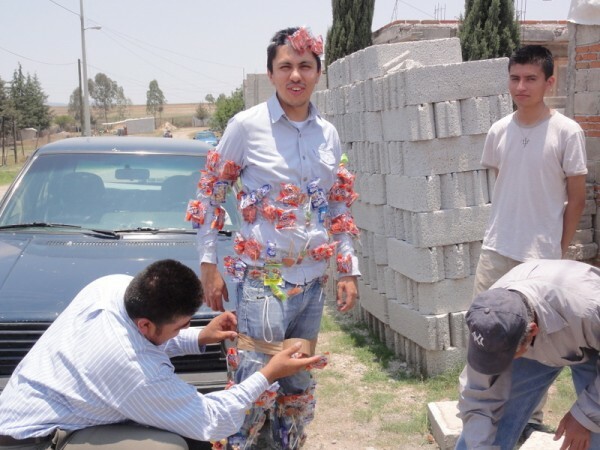 It looks that is probably is a different detergent that we are using, and combined with his sweat, it causes the allergic reaction in his skin. For Rachel our daughter, as our neighbor kids smashed her finger with a rock – she is doing much better. 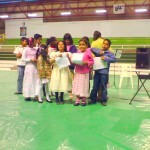 This last Saturday we went to Aguascalientes. 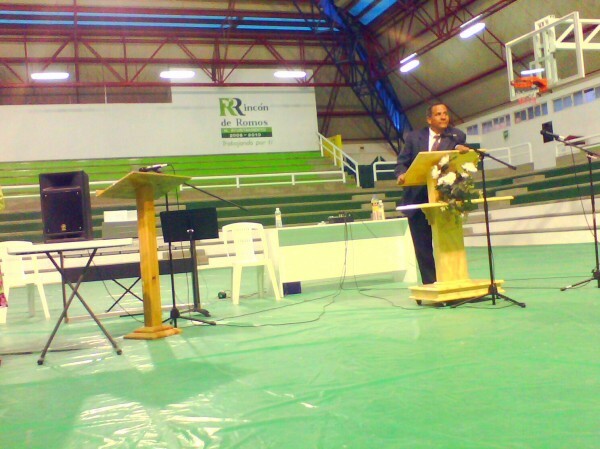 Pastor Juan Padilla invited me to preach at his Family Conference. 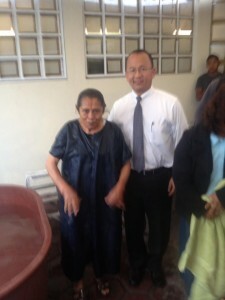 Pastor Danny Ortiz from Texas was also there Thursday and Friday. 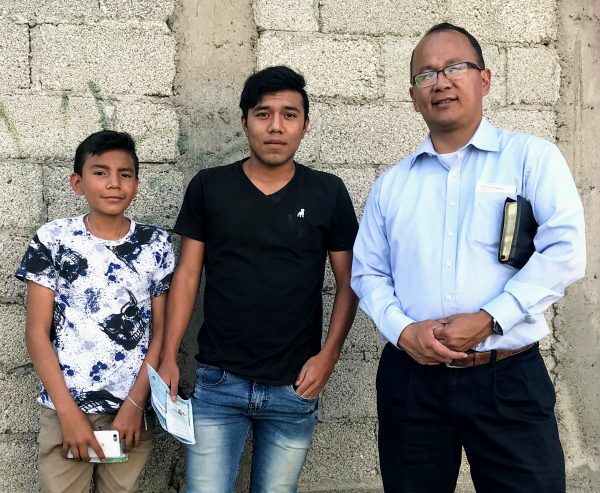 By the way, if you can pray for his wife… when he arrived from Mexico on Saturday, he had to take his wife to the ER and she had to have surgery. Pray that she will get better. (I don´t have the details of what happened). Anyway, it took us 6 hours to get there. To go to Querétaro is now very easy using the Arco Norte. (A new toll road from Puebla, to Querétaro – skipping Mexico City, and costs $255 pesos, about $22 dollars) From Puebla to Querétaro is about 3 hours. And from Querétaro to Aguascalientes another 3 hours. 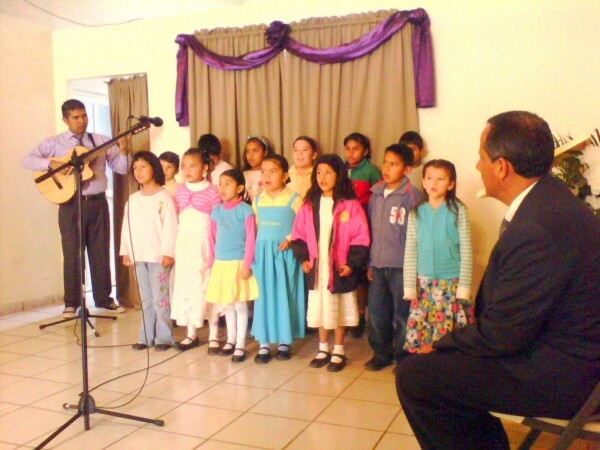 The church is located in Rincón de Romos, AGS, about 30 minutes north of the city of Aguascalientes. 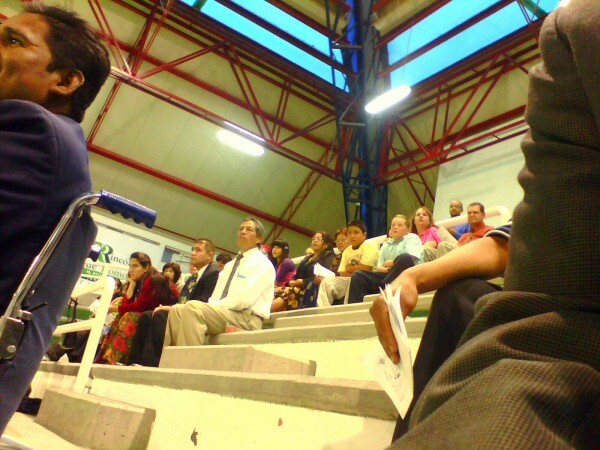 Pastor Padilla asked the city if they could use the municipal gym, and the city major gave them permission to use it! It is very nice and big. Almost like a US basquetball gym. We arrived 10 minutes before the service started! We had a good service at the gym. 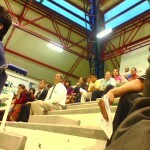 Two or three other churches came to the conference. 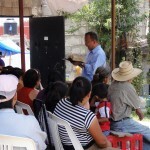 While I was preaching a saw a men holding his face and crying for what I was saying. Later that day, the Pastor said that he is the husband of a dear lady that is just starting to come to church. They have been praying for him to come to church and they were very excited that he came for the conference. Many decisions where made that night. 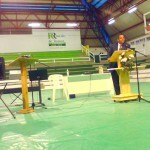 The following day I thought and preaching during the morning service. We ate at the church, and had some time to rest before the service for Sunday night. At 6 pm we were back and preached again about the family. 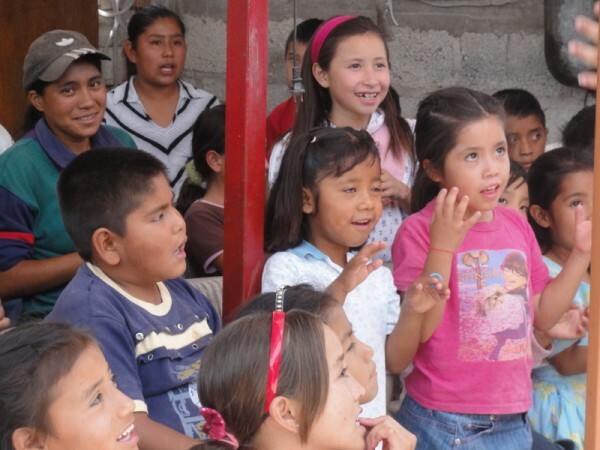 I preached from 2 Kings 20.15 where the Bible says: “What have they seen in thine house?” Mainly I said that our children need to see less worldliness and more holiness – and love. On our way back, I decided to go a different route. We went to San Luis Potosí first, and then Querétaro. This added an extra hour to hour driving, but we were not in a hurry. 45 minutes after Querétaro, before taking the Arco Norte, we stopped at McDonald’s for one whole hour. Our 6 kids were very happy. Interestingly, it is the only McDonald’s from the border that you see in the freeway. (There are many McDonald’s in the cities, but not many on the freeways). We have another McDonald’s right when you get to Puebla. And maybe 6 or 7 more McDonald’s in the city of Puebla. Last Thursday night Bro. Tim Aguiar and I visited Cesar and Soco. 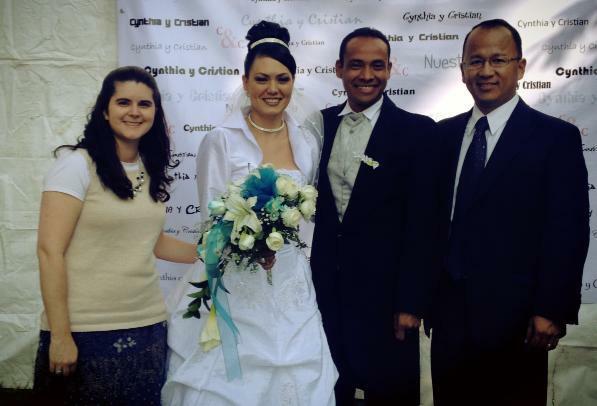 They just got married in December and are now attending our church Sunday nights. Bro. 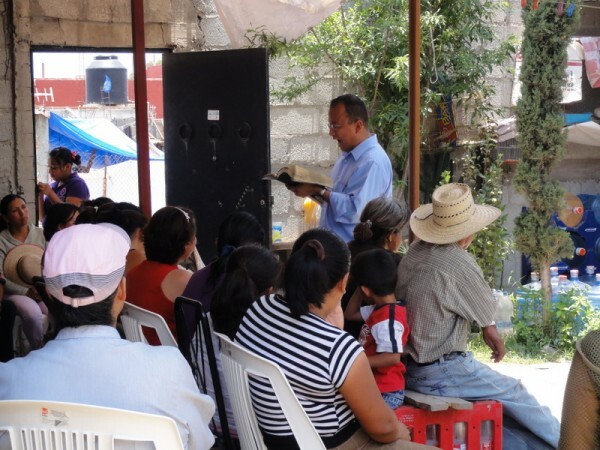 Tim called me on Sunday while we were in Aguscalientes to let me know that they came for the first time on Sunday morning. They even signed up to the bowling activity that we are having for married couples in few more days. And last Friday night Bro. 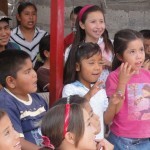 Tim and I visited a family that I had visited 8 years ago when we first arrived in Puebla! The first time I visited them, they told me that they wanted to come to our church because there was a lot of gossip in their church! It turn out that the other church was a good church. I told them that the only reason to leave a good church is that if the Pastor was having an affair or was teaching heresy. At that time, we only had 5 people in our church and we really needed more people to come to our church, but we did what was right. We meed again after 8 years! They told me that they decided to stay in the other baptist church. Then after 3 years, the Pastor left and they also left the church (the new Pastor is not baptist). Then they visited many other churches and got really frustrated because they were use to a good independent Fundamental Baptist church. Finally, they found our church and started to come. When I saw them, them seemed familiar, but it wasn’t until we visited them that I knew I knew them! And they live literally 5 blocks from our church! They never say they never saw our church before because the bus that they take to work doesn’t go by our church. Anyway, they are very happy with us now. 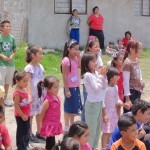 They will start a disciple ship program in about 3 more weeks. Please also pray for them. 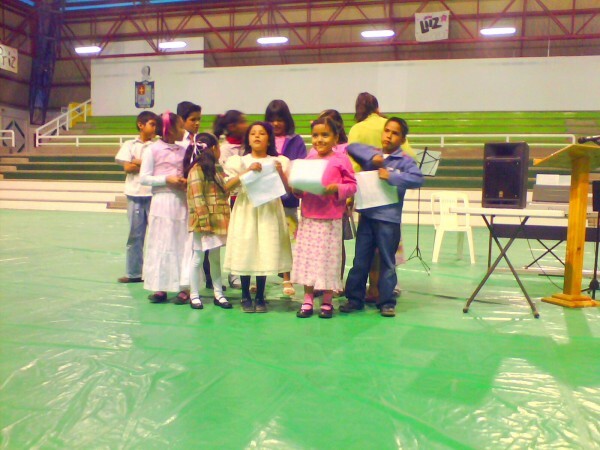 They are the Velazco family. 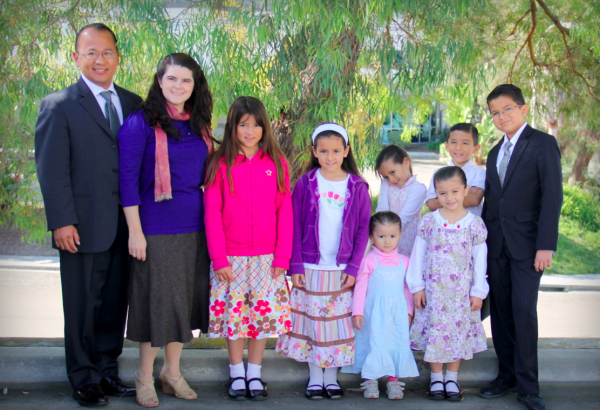 We only had to wait 8 years for this good family to come to our church.